These hand painted ceramic salt and pepper shakers are both fun and functional. - Packaged in full color gift box. 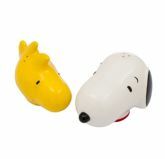 - A great gift for Peanuts fans! - Product Dimensions: 3.75" x 2.5" x 3"